Larry Corcoran appeared on the mound for the Mutual and Chelsea clubs of his native Brooklyn in the early weeks of the 1877 season, transferring to the Geneseo Livingstons in late June. By August, he was a member of Buffalo pitching staff, as that city entered ranks of professional baseball for the first time. All these clubs, like Springfield for which hurled in 1878 and 1879, were mediocre at best, but future stardom herd already been predicted for Corcoran. "He has wonderful speed for his strength, and with it a troublesome curve. He also has more than ordinary command of the ball in delivery for so swift a pitcher. He is a good 'headwork' player in the position, and with such a catcher as Snyder or Flint able to support his great pace, it would be difficult to get a base-hit from his pitching." Those words describing Corcoran appeared in the September 13, 1879 issue of the New York Clipper. The following month it was announced that Corcoran would pitch for Chicago in the 1880 season. A highlight of the 1880 campaign was Corcoran's June 4 16-inning 1-1 tie against Providence and John Montgomery Ward. From June 7 through July 13, he won 13 consecutive games. Corcoran's 1-hit victory on August 10 against Ward was surpassed nine days later when he held Boston hitless in a 6-0 triumph. His 43 victories that year is the third highest in baseball history for a rookie - topped only by the 1876 totals of Al Spalding (47) and George Bradley (45). Corcoran's 1881 games-won total fell to 31, but it was still good enough to tie for the National League lead with Jim Whitney of Boston. His top pitching performance of the year was on August 4, a 2-hit shutout against Buffalo and Jim Galvin. Corcoran's combined victory total of 74 for his first two years has been surpassed in baseball history only by Matt Kilroy's 75 gained for Baltimore in 1886-1887. In 1882, Corcoran enjoyed two 10-game winning streaks: June 29 through July 29 and September 1 through September 30. The latter streak included a no-hitter against Worcester on Sept. 20. Chicago's support at the plate for Corcoran was superlative; they scored six or more runs in 23 of his 40 games, including 35 runs scored on July 24. After returning to the 30-victory circle in 1883, Corcoran for awhile considered signing with the Chicago club of the fledgling Union Association for the succeeding season. He was, however, forced to rejoin the White Stockings for a reputed $2,100 after Chicago owner Spalding threatened him with blacklisting. Corcoran's 1884 season featured his third no-hitter (on June 27 against Providence). Corcoran had then reached the 30-victory plateau four times - a total exceeded by only five mound immortals: Kid Nichols (7), Tim Keefe (6), John Clarkson (6), Cy Young (5) and Tony Mullane (5). At the end of the first four weeks of the 1885 season, Corcoran's won-lost record stood at 5-2. It was then reported that he had so strained the muscles of his shoulder that he couldn't throw. In the next few weeks, he showed no improvement and Chicago gave him his release. New York signed him in July, but he took the mound only three times for the Giants, winning 2 and losing 1. His 8-3 victory over St. Louis on October 8 was the last game he was to win in the majors. Mickey Welch relieved in the eighth in that game after he sprained his ankle. Corcoran pitched only four games after 1885 - two each in 1886 and 1887 - and was charged with the loss in three of those games. He appeared briefly as a player and umpire in the minors during the next few years. In the spring of 1891. however, he was forced to give up all such activity after a severe spell of sickness from which he never recovered. He died on October 14, at the age of 32, a victim of Bright's disease. Corcoran possessed all the attributes of greatness except durability. 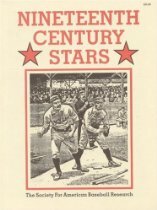 To learn more about the SABR's Nineteenth Century Committee, click here. This page was last updated August 10, 2016 at 7:03 pm MST.